This lovely house is located in the village of Chernookovo. The village is a nice size with two shops a cafe/bar and its own church. The Black sea coast and a beautiful fishing lake can be found just 18 miles away at Durankulak. The Municipal town of General Toshevo is 8 m away and Varna airport 60 miles. The house sits on a corner plot on a quiet residential street. The 800 sqm garden is pretty and well tended with shrubs, fruit trees, grape vines, a patio area and outbuildings for your storage needs. Double gates lead to off road parking at the side of the house. Inside is a spacious 100sqm comprising large open plan kitchen/diner/lounge, two good-sized light bedrooms and a fully tiled bathroom with wash hand basin, wc and bath. The house has been recently renovated and features brand new plumbing and rewiring. There is UPVC double glazing and central heating throughout. All of the fixtures and fittings are of a high quality and each room has been tastefully decorated. All that remains to do is fit your own choice of kitchen and floors and move in. The owner of this property can also offer you the oppurtunity to buy an additional plot of land located next door. 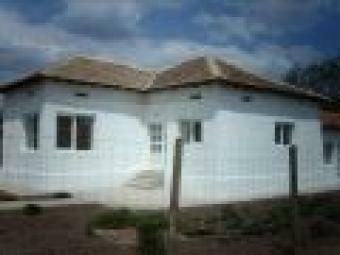 The plot is 770 sqm and is 5 euros per sqm. Yet another great property investment from Bulgarian Village Homes!